Last year, just before we welcomed Milo, I was feverishly trying to finish magazine content for 2018. Yup, we work a year in advance for lots of projects! It was a sunny, crisp afternoon and this little number waltzed out of the Kartes kitchen. I remember I couldn’t stop eating the bits off the top between shots. I told Mike I thought it needed less to make a better photo. HA! No, more like my pregnant self just wanted to eat this incredible no-churn delight! 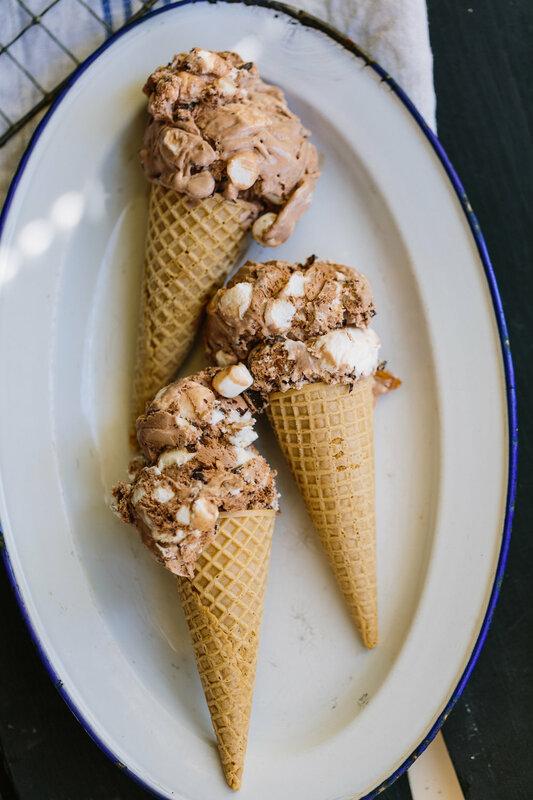 Rocky Road was my dad’s favorite ice cream growing up, he always choose it! A favorite ice cream flavor is so personal; it says quite a lot about the individual. 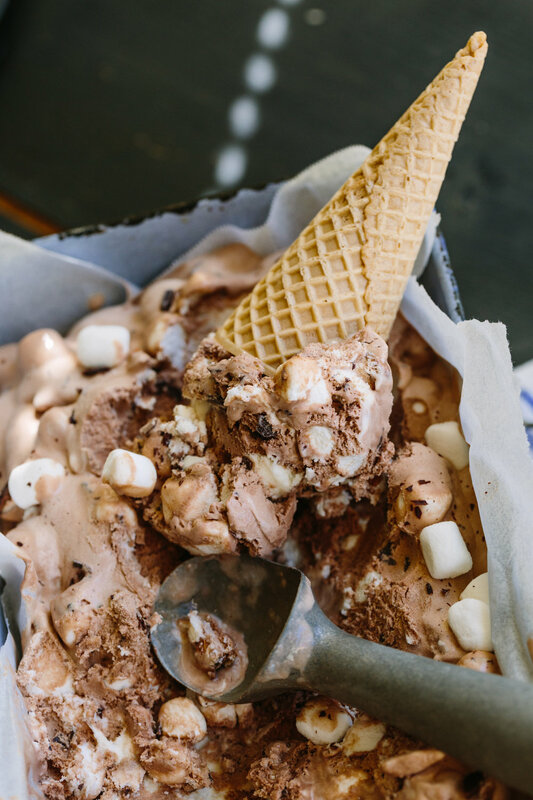 I always figured Dad liked Rocky Road because life can get hard and is filled with bumps, but sometimes those bumps are bits of chocolate, almonds, and mini marshmallows. It was ice cream as a metaphor for life: bumps along the way that are ultimately good because they push you, enrich your life by asking you to rise to the occasion. I had no idea I was training up for a life in motivational speaking at the ripe age of 12, but c’est la vie. I’ve always been able to find the good, the silver lining. Even after a good cry I can pick my head up and find the reasons why it’s going to be okay. I’m an optimist! I want this for you today. Pick yourself up, get going on those dreams, that degree, that project. Start right now. Choose healing. My favorite scripture for this season of life is 2 Corinthians 4:8: We are hard pressed on every side, but not crushed; perplexed, but not in despair. Life has some MAJOR upsets but we are here, breath in our lungs, ready to conquer the day. 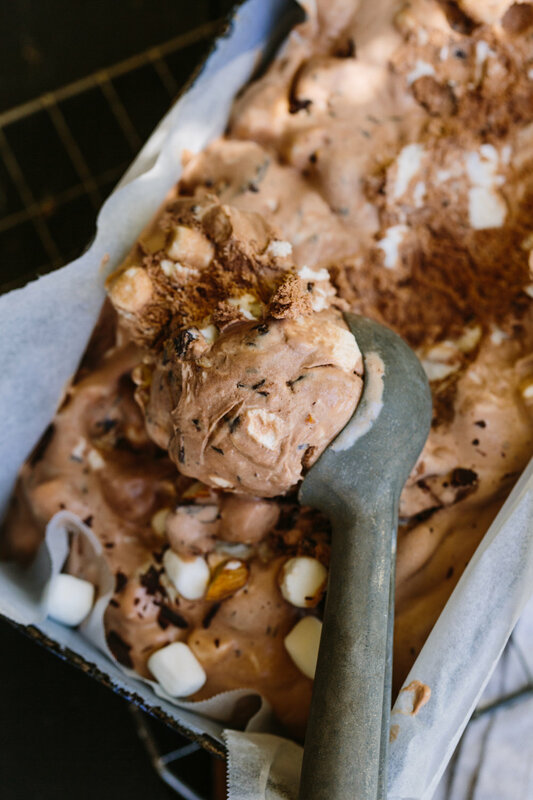 Please make this NO-CHURN Rocky Road ice cream! Oh, yes! In unrelated news – and before you run off to prepare this delectable treat – we are launching our newsletter! The first one goes out on August 1st or thereabouts! Want to get on the list? You’ll hear everything we’re doing here at Rustic Joyful Food FIRST! Click here to sign up! Whip heavy cream, salt, vanilla, and cocoa powder until the stiff peak stage. Gently fold in the sweetened condensed milk, chocolate, marshmallows, and almonds. You want to be very gentle so as to not deflate the whipped cream because this is where the light and airy texture comes from. Spoon ice cream in a freezer-safe container with a lid and freeze for 4-6 hours before serving.